1 . A company is developing an Internet store for its website. Which protocol should be used to transfer credit card information from customers to the company web server? • Select the routing protocol to be configured. • Update the ip host configuration information with the device name and new interface IP address. 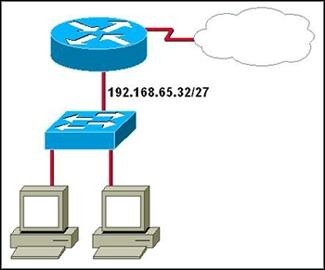 • Configure the routing protocol with the new network IP address. 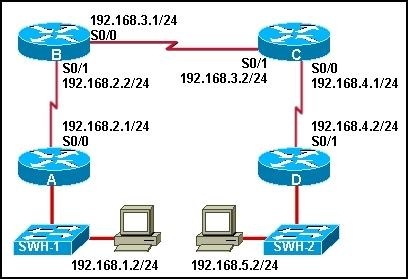 • Configure the routing protocol with the new interface IP address and subnet mask. • Configure the routing protocol in use on all other enterprise routers with the new network information. 5. How does TCP ensure the reliable transfer of data? • if data segments are not received from the source, the destination requests that the segments be resent. • If an acknowledgment of the transmitted segments is not received from the destination in a predetermined amount of the time, the source resends the data. • TCP uses the SYN-ACK portion of the three-way handshake to ensure that all data has been received. • The TCP Protocol Interpreter process verifies the transmitted data at source and destination. 6. A network administrator is asked to design a system to allow simultaneous access to the Internet for 250 users. The ISP for this network can only supply five public IPs. What can be used to accomplish this task? 7. What is the most commonly used exterior routing protocol? 9. Why are port numbers included in the TCP header of a segment? 10. What is the purpose of the routing process? • The debug ip rip command displays RIP routing activity in real time. • The debug ip rip command can be issued at the user EXEC configuration mode. • The debug ip rip command displays a combination of the information that is displayed by the show ip route and show ip protocols commands. • Because of router processor usage, the debug ip rip command should be used only when necessary. • The debug ip rip command should be used instead of the show ip route command whenever possible. 13. A Catalyst 2960 switch has been taken out of storage to be used as a temporary replacement for another switch that needs to be repaired. About a minute after the switch has started, the SYST LED on the front of the switch transitions from blinking green to amber. What is the meaning of the amber SYST LED? • The switch has no configuration file in NVRAM. • The switch has failed POST and must be sent for service. • The switch is functioning properly. • The switch is in half-duplex mode. 15. After an unsuccessful ping to the local router, the technician decides to investigate the router. The technician observes that the lights and fan on the router are not operational. In which layer of the OSI model is the problem most likely occurring? 19. When customers use credit cards to make purchases at a small business, a modem is heard dialing a telephone number to transfer the transaction data to the central office. What type of WAN serial connection is in use? 20. A user reports being unable to access the Internet. The help desk technician employs a bottom-up approach to troubleshooting. The technician first has the user check the patch cable connection from the PC to the wall, and then has the user verify that the NIC has a green link light. What will the technician have the user do next? • Enter an IP address into the WWW browser address bar to see if DNS is at fault. • Use traceroute to identify the device along the path to the ISP that may be at fault. • Verify the IP address, subnet, and gateway settings using ipconfig on the PC . • Connect to the user home router to check firewall settings for blocked TCP ports. • The router will block the ping request message. 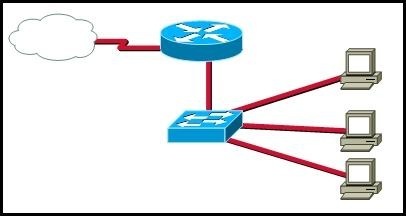 • The router will reply to the echo request with a proxy ping response. • Workstation A will send a UDP ping request message to workstation B. • Workstation B will send a UDP ping reply message to workstation A. • Workstation A will send an ICMP echo request message to workstation B. • Workstation B will send an ICMP echo reply message to workstation A. • The data conversation was started by the HTTP application process running on the client. • The data conversation is identified by TCP port 80 on the client. • The user started the data conversation by sending an e-mail. • The IP address of the Internet server is 192.168.17.43 . • The Internet server will send data to port 8547 on the client. 24. What is one purpose of the TCP three-way handshake? 25. Which type of address is 192.168.17.111/28? 26. A customer reports connectivity problems to an ISP technician. Upon questioning the customer, the technician discovers that all network applications are functioning except for FTP. What should the technician suspect is the problem? 29. A user reports being able to access the Internet but not being able to download e-mail from the mail server at the ISP. What should the user check on the user workstation? 33. How do port filtering and access lists help provide network security? • They prevent specified types of traffic from reaching specified network destinations. • They alert network administrators to various type of denial of service attacks as they occur. • They prevent viruses, worms, and Trojans from infecting host computers and servers. • They enable encryption and authentication of confidential data communications. 35. 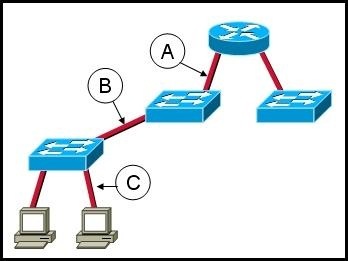 What is used by a routing protocol to determine the best path to include in the routing table? 39. What is true regarding the differences between NAT and PAT? • PAT uses the word "overload" at the end of the access-list statement to share a single registered address. • Static NAT allows an unregistered address to map to multiple registered addresses. • Dynamic NAT allows hosts to receive the same global address each time external access is required. • PAT uses unique source port numbers to distinguish between translations. • The router is connected to a router named Boise. • Router RTB is connected to a Cisco 1841 router. 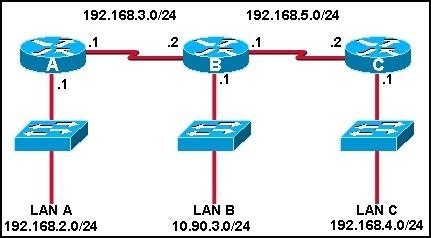 • Router RTB is directly connected to two other routers. • The IP address of the router interface connected to router RTB is 192.168.2.6 . 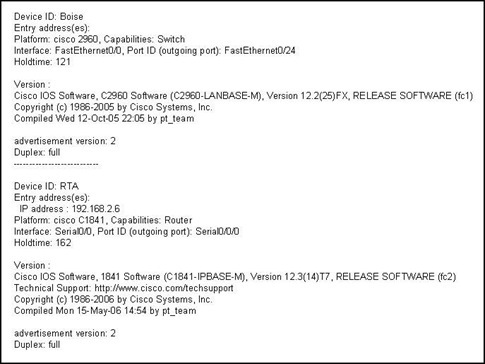 • The RTB router is connected to two Cisco devices by Fast Ethernet links. Refer to the exhibit. The network administrator uses the command below to configure a default route to the ISP network : RTB(config)# ip route 0.0.0.0 0.0.0.0 10.1.1.6 A ping issued from the ISP is successful to router RTB. However, ping echo request packets arrive at a host that is attached to the Fa0/0 interface of RTB, and the replies do not make it back to the ISP router. What will fix this problem? • The ISP must be configured to forward packets from the 192.168.1.0 network. • The ip route command needs to be edited so that the next hop address is 10.1.1.5. • The ip route command needs to be edited so that the 192.168.1.1 address is the next hop address. • The ip route command should be removed from the RTB router configuration. 42. A network technician is using a network management station to gather data about the performance of devices and links within the ISP. Which application layer protocol makes this possible? 44. A hacker attempts to reach confidential information that is stored on a server inside the corporate network. A network security solution inspects the entire packet, determines that it is a threat, and blocks the packet from entering the inside network. Which security measure protected the network? 45. How many host addresses may be assigned on each subnetwork when using the 130.68.0.0 network address with a subnet mask of 255.255.248.0? 46. In an IPv4 environment, what information is used by the router to forward data packets from one interface of a router to another? 47. A small tire retailer requires a low-cost WAN connection to its headquarters in order to manage its inventory and process customer sales in real time. Which WAN connection type is best suited to its needs? 48. The command copy tftp running-config has been entered on the router. What will this command do?